Umm... Never Mind. Today, we will be discussing on removing credit links from blogger. Most of the default blogger templates looks ugly. So, most of us use custom blogger templates but there is a problem; the template creator writes their credit links in footer of blog. This makes us to be more rude. The blog is ours but the template creator writes their name in credits. So today, I will reveal you the ways to remove the footer credit links from blogger. If you have any queries then you can ask us via comments. And I will remove credit links from there and will provide the template to you guys! i Have A Problem I enter this code bt its not hide?? Kindly Send Me Your Template! Your post is worth of attention. Maybe Blogger suspend our blog if we remove the footer link? February 17, 2016 at 8:56 PM delete This comment has been removed by the author. Thank you so much dude! Check my website also: Click here to visit. Good news... The same article is here too. Bro You are the best.. i have been searching for this since last year 2015.. but thank God i stumbled on youe site. av removed the theme credit and powered by blogger YAH! From Nigeria. thanks. Punjab Press V.5 NOT Working ! I like how you make your Post... Its Very Clean and with good Explation and Screenshots.. Thanks Alot Once Again.. keep it Up.. Please Help me How to remove Blogger Template Credit Links! i really thanks full to tyou and your post.. I can't find any line as you say. There is only an "attribution 1" widget, but without the div code, I can't modify it. Any solutions? www dot pulbere-de-stele dot com, the Simple template. How to i remove footer link on my blog? Please visit Adm and then help me! June 25, 2016 at 7:03 PM delete This comment has been removed by the author. bro can you check my blog www.howtech.info because i write all the unique post but this blogs not ranking i am little bit confuse what should i do or not ? i cant remove the credit code i have sent the template to your mail please help me.. I want to remove complete credit not want to keep there because it's passing link juice even if it's hidden. God will abundantly bless you for this great post, i have tried some online to no success. This post has really helped me, so thanks. It works, but i think it's <div style='visibility:hidden' instead of <div style="visibility:hidden"
Many thanks, it really worked. Thanks for this awesome trick. Must visit for more awesome tips..
bro it will hide them from the footer i guess, it will be there but un visible. Thanks for the nice trick. thanks admin for sharing up such an informative and useful article. great work keep it up. great post. keep up your superb work. thanks for sharing. 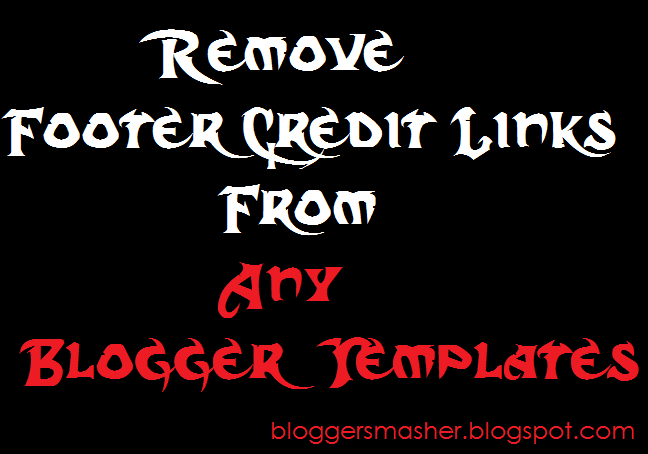 no need to hide credit any blogger templates,i will help to remove non-removed credit link. December 31, 2017 at 11:47 PM delete This comment has been removed by the author. I enjoy your way of writing truly enjoy this web site. You are always providing much useful and helpful content. It is really great job you are doing. Keep it up. I have read your post, It's very informative and helpful for me. I admire the valuable information you offer in your articles. Get Premium Blogger Template Without Footer Credit. Paid version for free. Get Best love tips in hindi. If you need any love problem and there Solution? So visit us. And share ur problem. We are try solving ur prblm. O yeah! I am on blogger thanks for the help bro. Properly promoted has contributed philosophical details and also Redirect Http to Https. We have by no means examine virtually any write-up a lot more extensive as compared to this kind of. It is totally clothed and much hassle-free write-up. Thank you regarding revealing this specific and also beneficial viewpoint with us. Fantastic perform!